Occasionally I receive inquiries from students who’ve been assigned the unfortunate task of writing a paper about one of my books and/or my life as a writer. I love chatting with students and I always make an attempt to answer student emails when time allows. Here’s an interview (updated & edited for length) with a college student who was tasked with writing a profile of someone in the arts & entertainment industry. She asked some great questions! Student: When was it, exactly, that you realized writing might be a career path you wanted to take, and why? Nan: I learned to read when I was 4 and I loved the escape that books offered me. I was extremely introverted as a child and I also had a difficult family life due to my father’s alcoholism (he died of alcoholic cirrhosis when he was 39 and I was 9). I spent a lot of time alone in my room and writing was a natural extension of my love of reading. Being that I was shy, writing felt like a safe way to express myself and I enjoyed it a lot. I attempted to write my first novel in 4th or 5th grade. It’s a futuristic story called “Forgotten,” about two friends who get left behind on Earth while everyone else on the planet has moved to Mars. (This was in the early ’70s, not long after Apollo 13, which no doubt ignited the imaginations of schoolkids everywhere.) It ended up being only a few pages, but I still have the handwritten story and the rough draft. In high school I was the editor of the yearbook and had a column in the school paper. I knew I wanted to be a writer but I was concerned about being independent and making enough money to live on my own (i.e., not with my mom & step-dad) after college. That’s why I chose to major in Advertising (at University of Illinois, Urbana-Champaign). I felt Advertising was a solid career where I could use my creativity while also making enough money to be self-supporting. During my college summers I worked at Leo Burnett Advertising in Chicago (two summers) and at a smaller ad agency (also in Chicago) called G.M. Feldman & Co. (one summer). Student: How did you get started? Nan: My plan was to work at an ad agency in Chicago after graduation. Instead I got married three weeks after graduating (because love), and my husband (Pat, a lieutenant in the Marine Corps at the time) got orders to Okinawa, Japan for three years. It turned out to be a great experience for both of us, and I got my first job in publishing in Japan, where I was the editor of a weekly magazine called This Week on Okinawa. I went back to work in the magazine business where I was the managing editor of a computer magazine called Personal Publishing. This led to my freelance career as a tech journalist and eventually to my first published book, a four-color guide for graphic designers on how to use desktop publishing software (Quark Design: A Visual Guide to QuarkXPress). My career as a tech writer in the late ’80s and early ’90s turned out to be financially lucrative but it also had a high burnout rate. Even back then, the technology was developing so fast that the tech writers in the industry were expected to constantly churn out new stuff. Student: What would be a (short) self-written biography of yourself and your writing career? 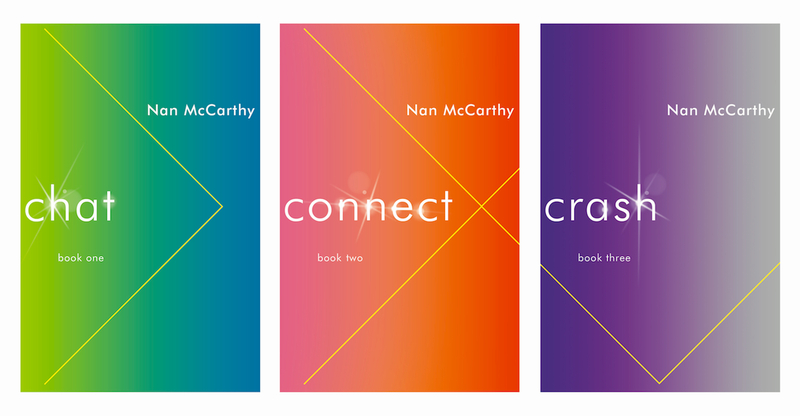 Nan: Nan McCarthy is the author of Since You Went Away, Chat, Connect, & Crash, Live ‘Til I Die, and Quark Design. The originally self-published Chat, Connect & Crash series was released in trade paperback by Simon & Schuster in 1998 and widely translated. Nan later regained the rights to the series, publishing new, updated editions in 2014. A former magazine editor & tech writer, Nan founded Rainwater Press in 1992 and began selling her books online in 1995. Nan and her husband, a veteran who served 29 years in the Marine Corps, are the proud parents of two adult sons. Nan wrote Since You Went Away after taking a ten-year break from full-time writing to care for the family during her husband’s frequent military travels. That’s my professional bio. On a more personal level I guess I’d say I’m a mom, vet spouse, writer, sister, friend. I love my family and I’m still close with my three best friends from high school. I love reading, nature walks, our rescue dogs & cats, and classic movies. Student: Can you describe your ideal working conditions? Nan: A few years ago when I started working on Since You Went Away I moved my writing area from the basement office (which had no windows) to a little corner of our bedroom where there’s a big window. I discovered I need daylight to keep my spirits up while I’m working. My best writing time is during the day, what would be regular business hours for most people. I stick to a regular writing schedule—generally Monday through Friday, from about 7 a.m. until 6 p.m. or later. Depending on where I’m at in the writing process, I’ll write on Saturday and Sunday too if I can. If my husband is traveling out of town I’ll write later into the night. I write best when the house is empty and completely quiet. Student: How would you describe your tone in writing? Nan: I don’t set out to write with a certain tone in mind. I’m mostly concerned with telling the story. I work hard at making myself invisible to the reader so they can get lost in the story and experience what the characters are experiencing without being distracted by the writing itself. I appreciate beautiful writing in others but I like to get out of my own way. I’m a strong believer in using language as efficiently as possible. Whenever I can, I’ll choose the shorter, simpler, more precise word over a longer word. One thing I do concern myself with is rhythm. I read aloud everything I write and if I stumble over something, I keep rewriting until it sounds completely natural. Working as a computer journalist has had a huge impact on my writing style. In tech writing, even the smallest detail such as a punctuation mark has to be precisely accurate. The way you structure a sentence has to be specifically engineered to help the reader understand and grasp incredibly complex concepts in the shortest amount of time. The language has to be straightforward and not the least bit confusing. I like to think of myself as a “word engineer.” People tend to think of writers as messy and haphazard individuals because we’re creative. But good writing involves logic, attention to detail, and problem-solving abilities, much more so than most people realize. That said, I do love writing dialogue, which is why I love writing epistolary novels. Emails are a unique form of conversation, a hybrid of talking and writing. My latest novel (Since You Went Away) contains lots of dialogue in the form of recounted conversations within the emails themselves. In real life I love listening to people talk, paying close attention to the rhythm of people’s voices, the idiomatic expressions they use, and each person’s body language while having a conversation. I tend to be a boring dinner companion in restaurants because I often prefer eavesdropping on other diners’ conversations rather than talking to my husband (but he’s used to that by now). Student: What has been your most successful publication and why? Nan: Chat, Connect, and Crash are probably my most commercially successful books so far (not counting Since You Went Away which is currently being released in four parts). But I’d have to say, as far as my completed works, the book I’m most proud of is Live ’Til I Die: a memoir of my father’s life, which I self-published in 2002. It was a very personal project obviously, but I’m proud of the quality of the writing in that book as well as the research I did in interviewing my dad’s childhood friends, our remaining family members, and medical professionals who treat people with addictions. I feel good about the positive nature of the book, its sense of hopefulness in spite of the tragedy of a young man like my dad losing his battle with alcohol. Most addiction memoirs are success stories as told by the person who overcame their addiction, so Live ’Til I Die is unique in that way because my dad didn’t survive to tell his story. But even with its incredibly sad outcome, I was able to shine a light on the destruction of addiction while at the same time highlighting the positive aspects of my father’s character, showing his humanity and the lasting impact he left on the lives of the people who loved him. I also put a spotlight on the strength of my mom during those dark times and the positive actions she took in raising my sister and me so that neither of us ended up following our father’s path of addiction, even though we’re both genetically predisposed. Student: What would you want prospective fans to know about your work? Nan: My main goal is to give the reader a memorable and entertaining emotional experience. A secondary goal is to make it easy for the reader to keep turning the pages. I put a huge amount of effort into making my writing appear simple and breezy, but in reality there’s a lot going on under the surface. I want the reader to have fun reading my books. Even when the topic is serious—especially when the topic is serious—I like to inject humor in unexpected places. Plot is important too, of course, and I want the reader to feel propelled and compelled to find out what happens next. But even more important than plot (to me at least) is creating interesting characters the reader cares about. Three-dimensional, unique characters that make the reader lie awake at night wondering how things are going to turn out for them. Topically, I like to take on meaty subjects that are of current interest to people. Nan: Other writers inspire me. I’m an avid reader and I read a wide variety of books, from narrative non-fiction to literary fiction and everything in between. I love marveling at an especially well-written passage, and I love hearing the success stories of other writers. I don’t believe another writer has to fail in order for me to succeed. In fact I believe the opposite—the more writers who succeed in stirring up excitement about books and reading, who are able to light a spark inside the reader, the better for all of us. Movies inspire me. I love going to see new movies in the theatre and I love watching old movies on TV. I love old movies for the witty and intelligent dialogue. I go to the movie theatre regularly, either by myself or with friends or my husband. Movies are a chance for me to turn off my brain for a couple hours and escape the pressures of the outside world. I always come out of a movie inspired to write. For me writing a good story is a lot like writing a screenplay because you want the reader to be able to visualize what you’re seeing in your own head. People inspire me. People I meet at parties, conversations between strangers I overhear in restaurants and other public places. I love people-watching. I’m also inspired by current events. The novel I’m currently working on is about a military family during the Iraq war. The story involves issues such as PTSD among veterans and Islamaphobia. Those were big topics when I started writing the book in 2012 and they’re even more relevant today. Student: Is all your work similar in nature, in general, or how does one novel differ from the next? Nan: My current novel (Since You Went Away) is in the epistolary format which makes it similar to Chat, Connect, and Crash. The similarities end there however. Topically, I’d say my work is pretty varied. Quark Design is a computer how-to book. Chat, Connect, and Crash is a love story. Live ’Til I Die is an addiction memoir. My current project focuses on a military family during wartime. There are similar themes that tend to pop up in all of my novels. One of them is alcohol addiction, obviously influenced by my childhood experiences. It’s not something I consciously set out to include in a novel, but it’s something I have intimate knowledge of and is part of the fabric of who I am. So the theme of alcoholism tends to weave itself naturally into the characters I create. In Chat, Connect, and Crash, the male protagonist (Max) is a borderline alcoholic. Live ’Til I Die is all about alcoholism. And in my current novel, one of the characters is a veteran suffering from PTSD who turns to alcohol as one of the ways he deals with the stress of transitioning from military life to civilian life. Student: What has been the response to your work? Nan: Largely positive. My favorite feedback is hearing from people who tell me Live ’Til I Die resonated with them, because so many people struggle with addiction or have a loved one who’s an addict. Although I’ve just recently released Part One of my new novel Since You Went Away, I’ve been pleasantly surprised with the positive feedback so far. I’m working on Part Two now, and I hope I can keep that positive vibe going until I release all four parts. With Chat, Connect, and Crash, I was surprised and delighted to learn the books are required reading in some college communications courses. A few years ago I was contacted by a young woman in Italy who wrote her doctoral thesis on Chat. The Chat, Connect, Crash trilogy is a time-capsule of early Internet communication. Because the story takes place in the mid-1990s, it shows how email not only changed the way we communicate with one another but how it changed our relationships. I’m very proud of that. But there are also people who hated those books. And that’s OK. As a writer you have to learn to not take the negative feedback to heart. Worrying about that stuff will kill your creativity for sure. So that’s why I try to write the kind of books I myself would like to read. If the end result is something I’m proud of, that I know in my heart was the best work I could produce at that moment in time, I’m happy. The world would be a pretty boring place if everyone liked the same books. Student: How do you think your personality is reflected in your work? Nan: I like books with substance and humor that give people hope. I try to imbue those qualities in my own work. If other people think of me as a person who’s substantive, funny, and hopeful, that would make me happy. Student: How do you think the industry has changed since you started? Student: What do you hope to ultimately accomplish through being a writer? Nan: I want to make people smile, entertain them, give them an escape from the stress of daily life, and give them hope. I like the idea of leaving something of myself behind, of someone reading my words after I’m gone. I want to keep growing, to be a better writer today than I was yesterday, a better writer tomorrow than I am today. For me—like a lot of writers—writing is survival. It keeps me sane, makes me happy and joyful. Aside from spending time with my loved ones, the best feeling in the world is a day when I’ve written a lot of words. My journey with Chat, Connect, and Crash has been an adventure—always interesting, mostly fun, and sometimes a little heartbreaking. From the first, self-published edition of Chat in 1995, to the publication of the trilogy in trade paperback by Simon & Schuster in 1998, to 2014, nearly twenty years later and the books once again self-published, my journey with Chat, Connect, and Crash has been an adventure—always interesting, mostly fun, and sometimes a little heartbreaking. With the release of new editions of the trilogy in 2014 and the upcoming 20th anniversary of the books in 2015, here are some of the highlights of my journey from self-published author to traditionally published author and back again. Chat is the story of two strangers who meet online, unfolding entirely through their email messages to one another. Although epistolary novels have been around for hundreds of years, Chat was the first full-length email epistolary novel ever written. (It was also among the earliest novels sold online directly to readers—more on that later.) Because of my previous career working at a computer magazine, I first got online in 1987, fueling my lifelong love affair with email and online communications. Amidst all the rejections, and still flying high from the simply exhilarating experience of having written a novel, it occurred to me that with my background in digital publishing technology (writing how-to books and magazine articles on page layout software, prepress and printing techniques), I possessed the technical knowledge to produce the books myself. Keep in mind this was several years before the advent of ebooks, so back then “the latest technology” involved using page-layout software to create mechanicals that would be used in the production of printed copies. It wasn’t quite as “easy” as some people claim ebook production is today, but the new digital publishing technology of the mid-1990s did allow me access to less expensive prepress and production methods, especially since I had the experience and knowledge to do the page layout and production work myself. So in late summer 1995 I began working with a book designer named David High, who I’d come to know when we worked together as freelancers on some corporate marketing projects and whose design work I featured in my computer book Quark Design: A Visual Guide to QuarkXPress (Peachpit Press, 1995). Although I’d only just finished writing Chat, I knew there’d eventually be three books in the series, so David created cover and interior designs for the entire set. I also hired one of my editorial peers at another computer magazine, Linnea Dayton, to copyedit the manuscript. Using David’s interior design templates I worked on page composition while also interviewing and getting bids from various printers recommended by my local PIA (Printing Industries of America) chapter. After settling on a printer, I finalized the digital files, sent them to a prepress shop for camera-ready output and film negatives (for the cover), and the book was ready for printing. 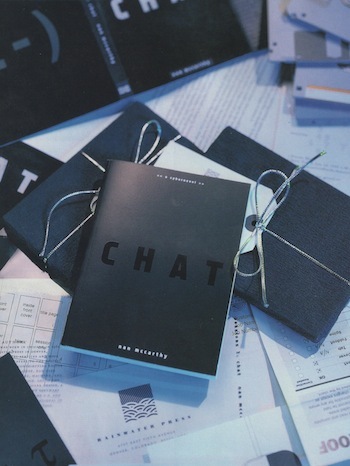 My plan was to mail out 250 promotional copies of Chat as holiday gifts to my colleagues in the computer industry, and by the end of December my promotion efforts succeeded in creating some nice buzz about the book as well as providing me with much-appreciated positive feedback and encouragement. Some of my colleagues even published brief write-ups about the novel in industry publications like The Seybold Report and How magazine; I was also invited to write a guest feature about my self-publishing experience for Publish magazine. Meanwhile I’d begun taking orders for the books via email, snail mail, and my toll-free number while also making plans to construct my very own Rainwater Press website where I could take my e-commerce to the next level with an online order form and credit card processing. For the website, I collaborated with another former colleague, Eric Llewellyn, a designer I’d worked with at a computer software company. Eric was at the cutting edge of HTML and Web design back in 1995, and with Eric’s design and programming skills and my copywriting and organizational skills, we were able to unveil the original Rainwater Press website in early 1996. (Though out-of-date, an archive of this website still exists at www.rainwater.com. For up-to-date information, you’ll want to continue visiting my current author website right here at www.nan-mccarthy.com.) I was now open for business as an author on the still-nascent World Wide Web, selling copies of my book directly to readers. Little did I know that the way I was selling my book (online) would be as much a part of the story as the book itself. The following year, in the summer of 1996, while I continued selling copies of Chat, I wrote the second book in the series, Connect, returning to the story of Bev and Max and their growing fascination with one another. This second book was also self-published, again with a print run of 2,500 copies (though using a different printer this time), copyedited by Linnea Dayton, and featuring another eye-catching cover design by David High. By this time things with the books were beginning to percolate. I was approached by Ted Nace, founder and publisher of Peachpit Press, who was interested in a co-publishing deal for Chat. This was a bold move on Ted’s part because Peachpit was primarily a computer book publisher, and Chat would be the publishing house’s first work of fiction. Ted and I came to an agreement, and in late summer 1996, Chat was released to a wider audience (including bookstore distribution) with a second print run of 20,000 copies. Along with the national bookstore distribution provided by Peachpit, I continued selling both Chat and Connect directly to readers via my website, email, and 800 number. In the summer of 1997 I wrote the third book in the trilogy, Crash, and Chinese translation rights to all three books were sold to Addison-Wesley in Taiwan. Around this same time, after the People magazine write-up in the spring of 1997, I was contacted via email by a literary agent in New York who’d seen the write-up and offered representation. With the blessing of Ted Nace and the release from my agreement with Peachpit, my agent subsequently sold the rights to all three books to the Pocket Books division of Simon & Schuster (one of the very same publishers who’d rejected the manuscript two years previously). Meanwhile, the books and my Rainwater website were continuing to get press coverage, with a second write-up in Publishers Weekly and articles in The Chicago Tribune, Newsday, The Chicago Sun-Times, New City, Chicago Books in Review, The St. Louis Post-Dispatch, and others. These were exciting times. I’d been working non-stop promoting the books in addition to spending a good amount of time processing and shipping orders coming in through my website. Although I enjoyed the marketing aspect of what I was doing, my first love has always been writing, and I yearned for more time to get back to writing and start work on a new novel. I viewed the offer from Simon & Schuster as an opportunity to make use of a larger publishing house’s marketing, sales, and distribution channels, taking Chat, Connect, and Crash to new levels while also allowing me more time to focus on my writing. Although I’d already more than recouped my self-publishing costs, the advance from Simon & Schuster (which my agent described as “respectable”) was a nice boost, both financially and career-wise. At the time the contract was offered, my agent mentioned S&S wanted to make some “very minor” changes to the ending of Crash that would take “two minutes.” I was slightly concerned but the changes were downplayed and I didn’t press further—after all, I was eager, inexperienced in the ways of traditional publishing deals, and didn’t want to jeopardize the offer. Over the course of the following year (it took about twelve months from contract signing to publication, even though S&S didn’t have to do production work on the first two books since they used my previously created QuarkXPress files for the interiors), I remained busy working with Pocket Books on cover consultations, marketing and promotion plans, production details, and figuring out the new ending they requested for Crash. I don’t want to spoil the ending for those who haven’t read the books yet, but suffice to say S&S wanted a “happier” ending than the one I’d originally written. Overall I didn’t have a problem with modifying the ending to suit their tastes, but the process was arduous—a lot of back and forth over a period of about two months (a lot longer than the “two minutes” originally mentioned)—with the end result being a compromise I wasn’t too excited about, but which the powers-that-be at S&S seemed happy enough with. Meanwhile, I had begun work on a new novel, and we continued selling foreign rights to the trilogy—to Simon & Schuster UK (who created the pink, green, and blue cover designs also used on the U.S. versions of the books), Turkish publisher Oglak, German publisher Goldmann, Slovenian publisher Ucila, and Dutch publisher Uitgeverij Prometheus. Simon & Schuster published all three books in trade paperback in the fall of 1998, with a print run of 30,000 copies. I’m proud to say the books were profitable enough that I “earned out” my advance relatively quickly, and the press coverage continued for a short while with write-ups in Mademoiselle, Entertainment Weekly, The Orange County Register, Washington Post Book World, and CNN.com (one of the earlier online news sites). I also signed an amended contract allowing Simon & Schuster to sell the trilogy in electronic format (the term “ebook” wasn’t widely in use at the time) on “portable handheld devices” such as the Softbook ($299), Rocketbook ($500), and EB Dedicated Reader ($1400-$1600), making digital editions of the books available for purchase in early 1999. While I continued to receive royalty statements and checks from Simon & Schuster for sales of Chat, Connect, & Crash, in 2000 I embarked on a new project, interviewing my father’s childhood friends for a memoir of my father’s life (he died young of alcoholic cirrhosis at age 39) called Live ’Til I Die, which I self-published in December 2001, just a month before my mom’s death in January 2002. Though sales of the memoir never came close to those of my email trilogy, writing and publishing Live ’Til I Die was one of the most rewarding experiences of my life, a project I’m proud of to this day. Not long after I completed Live ’Til I Die, and nearly four years after the trilogy’s trade paperback publication by Simon & Schuster, I received word from S&S in early 2002 that the Chat, Connect, and Crash books would soon go out of print. In exchange for some foreign rights monies that had never been paid to me, I negotiated delivery of several hundred copies of each book (copies that would’ve otherwise been destroyed). Also at that time, at my request and as per my contract, my agent sent a letter to S&S asking that the rights to the books be reverted back to me, but I never heard back from anyone. Although it wasn’t something I planned on, I ended up taking a break from full-time writing over the next ten years (though I continued accepting short-term gigs like writing a guest column for The Kansas City Star). Due to my husband’s career in the Marine Corps, we moved around a lot (including two cross-country moves during the time I was writing and promoting Chat, Connect, and Crash). By the time we landed in the Kansas City area in 2003, our two sons were approaching their teen years and my husband was traveling more and more (including a year-long deployment to Iraq in 2008). There just wasn’t enough of me to go around to be a full-time writer, a military spouse charged with running the household during my husband’s frequent absences, and the kind of mom I wanted to be to our two teenage sons. So writing novels was put on the back burner for a while—a long while. It was a decision I’m happy to have made, and though I missed writing full-time, the upside was that the time spent living my life and focusing on my family filled my creative well to overflowing. Surprisingly, during this period I continued receiving small royalty checks from Simon & Schuster, mostly for the ebook editions of the trilogy being sold via online outlets such as Amazon. I also continued selling a small number of printed copies of Chat, Connect, Crash, and Live ’Til I Die via direct orders from my website, email, and snail mail, and in 2011 Chat was the subject of a thesis paper by an Italian grad student named Antonietta D’Amore. Antonietta was a student at L’Orientale University in Naples, Italy who translated the book to Italian and interviewed me extensively (via email, of course) about Chat and the linguistics of Internet communication. By 2012, with my husband retired from the Marine Corps, one son graduated from college and another well on his way, I finally felt like I could get back to focusing full-time on my writing career. One of the first things I did was send a letter to the publisher of Simon & Schuster once again asking for a reversion of rights to the trilogy as per my contract (briefly mentioning I’d been waiting ten years for a response to my first request), and within a couple weeks I received a signed reversion of rights agreement from S&S. In 2012 I also began work on a new novel related to military life, the idea for which came to me during my husband’s deployment to Iraq in 2008. That novel is coming along well, and I hope to publish it sometime in 2017. In the first few months of 2014, I took some time away from writing my most recent novel to work on creating new, self-published editions of Chat, Connect, and Crash now that I had the rights back. What a thrill it’s been to once again have ownership of these books! Because so much time had passed and my digital files of the manuscripts were on old media such as floppy disks and SyQuest cartridges (and therefore difficult if not impossible to access), I ended up having to type all three manuscripts from scratch into new Word documents (which wasn’t so bad since I’m a fast typist). I also ended up digging through boxes of old files to find the first manuscript for Crash written in 1997, using it as a reference to restore the original ending. This in itself was a gratifying and exciting experience—with the original ending to Crash now intact, the trilogy on the whole feels stronger and more authentic to me. I hired Faith Simmons (who happens to be my niece in addition to being an editorial goddess) to copyedit all three newly typed manuscripts. I also contacted David High, who designed the original editions of the trilogy and who agreed to work with me again on creating fresh covers and interior designs for the new editions. And because of technological advancements over the last decade, I decided to hire a typesetter with skills in ebook adaptation (instead of attempting to do the production work myself this time). Kevin Callahan of BNGO Books created page mechanicals based on David’s new designs, and he also converted the books to the proper digital formats for upload to all the major online ebook retailers including Amazon, Apple, Barnes & Noble, and Kobo. In spite of the inevitable heartbreaks involved in any publishing venture, I’ve had more than my share of fun with these books. I’m grateful for every obstacle, every disappointment, and every person I encountered along the way. Each experience has brought me to this point in my life, a place I’m very happy to be. I’m excited about taking advantage of the many new technologies and platforms available to writers who want to self-publish these days. When I wake up each morning, my mind can barely contain the ideas I have for new books and new ways to market and sell them. The best part about my publishing journey? It’s only just the beginning.